We earlier previewed the upcoming treat of Nike as part of the celebration of the 10th anniversary of Doernbecher kicks. On September 28, Nike will release the Doernbecher Freestyle X Collection. But before releasing the 10th anniversary collection, Nike promised to re-release five classic Doernbecher kicks. 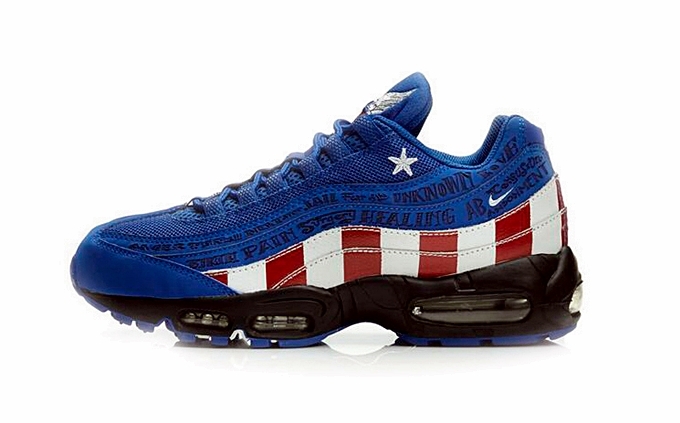 The first one is set to hit the market on July 6th – the Nike Armstrong’s Nike Air Max 95. This classic kick was designed by Armstrong when he joined the Doernbecher freestyle program in 2007 when he was just 15 years old. Thus blue-dominated American flag-themed kick will be available starting this Saturday for just $140 – a price that is definitely worthy of this classic DB kick from Nike.